Editor’s note: As a private citizen, Steve Salisbury has provided observations to United States high-ranking officials of both Republican and Democratic administrations. Salisbury played what could be said was a key role as a de facto precursor “intermediary” between US officials and Colombia’s FARC guerrilla group before the naming of a US presidential special envoy to the peace process between the Colombian government and FARC, which together signed a peace accord in late 2016. The report in three parts herewith is an edited, expanded version of one that Salisbury wrote and sent recently to US State Department senior officials and other US inter-agency officials who cover Venezuela. Click here for About the Author. Updated February 18, 2019. To view Part 1 of ‘Possible Options on Venezuela,’ please click on the following link. To view Part 2 of ‘Possible Options on Venezuela,’ please click on the following link. A) Helping beef up the personal security of Guaido and other Guaido transitional government officials. This could be done by facilitating top-notch private-sector security professionals to address and fill the array of physical, communications, digital, transportation, and storage security needs, etc. B) Assisting humanitarian and other constructive NGOs in carrying out their work in Venezuela, bordering countries and elsewhere. For example, help doctors, health-care personnel and other humanitarian workers to make connections with the appropriate Guaido transitional government reps or those of neighboring countries working on Venezuelan issues. C) Continuing the momentum of concerted diplomatic action and tightening economic and other sanctions–including looking at secondary sanctions–against the delegitimized Maduro de facto regime. Explore or facilitate opportunities to investigate it further and deeper. It was reported that Venezuelan insiders blew the whistle on Maduro members’ supposed attempt to dispatch a plane loaded with tons of gold out of the country on a Russian private-contracted plane. Supporting and protecting whistleblowers should be a top priority. D) Step up public diplomacy across multimedia platforms. E) Helping the Guaido government to form its governing and services infrastructure. There have been news reports of limited direct contacts between US officials and some Venezuelan military personnel. And Maduro’s foreign minister Jorge Arreaza was reported to have said that there have been at least two meetings with US Presidential Special Envoy on Venezuela Elliott Abrams to listen to each other. So far, at least one general and a couple of colonels have announced their defection from Maduro to support the Guaido transitional government. And dozens of lower-ranking Venezuelan military personnel have mutinied against Maduro, scores of them being jailed and some tortured, according to human-rights activists. There apparently may have to be more incentive to get Venezuela’s officer corps to dump Maduro–who has bought off the top echelon of the Armed Forces by allowing it to run or have a hand in some government ministries, the oil industry, and food and health programs, which can result in all sorts of possibilities for its profiteering. Armed Forces officers and enlisted personnel face severe retribution from Maduristas if they bolt and would have to know that they will be protected and taken care of (and that means on the most basic levels of having food, housing, and work) if they defect to the Guaido transitional government. International humanitarian coalition naval ships’ infirmaries could attend to Venezuelans. “The images of the VEN security forces using trunks to block a bridge to prevent the entry of humanitarian aid is powerful and shows the world and the people of VEN that Maduro doesn’t care that his people are starving. “Again, there has to be a reward for those who jump early and a penalty to those who wait until the last minute. “Also, it is more important for leaders of field units to make the jump, that is those commanding troops rather than those flying desks at an HQ. Those commanding troops can lead troops to protect protestors, food convoys, the National Assembly and the Interim Leaders, as well as stop the Collectivos [sic]. This same Western government official added that during the Cold War the United States tried to spur defections of Soviet-bloc pilots by offering juicy rewards for them to defect with their planes to the West. The same approach could be used to try to get Maduro Air Force pilots to defect with their Russian-made Sukoi combat jets. As the British retired Royal Navy Special Boat Service member told me (green coloring added): “When the Venezuelan Armed Forces fracture, people will be looking for their own interests. All will be looking for their own lifeboat. 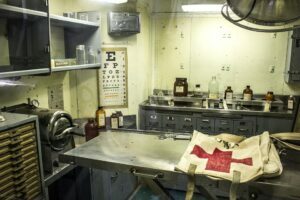 We should be able to offer lifeboats.” Which lifeboats are allowed to float and which to sink could be decided on a case by case basis, he added. H) Helping the Guaido government to perhaps raise its own military entity to “add” to and “complement” (not to replace) the already existing Venezuelan Armed Forces. This idea would have to be studied further and done within the parameters of the Venezuelan Constitution. I) The United States, in concert with the Guaido government, could deepen talks with Russia and China on the issues of Russia’s and China’s concerns over possibly losing their investments in Venezuela (such as in oil, among other things). If they knew that the departure of the delegitimized Maduro de facto regime doesn’t necessarily mean that Russia’s and China’s investments are completely down the toilet, they may just let Maduro go. J) Drill down in diplomatic discussions with Cuba on Venezuela. Cuba is worried about losing the reported some 55,000 barrels of subsidized oil it receives from Venezuela on average per day. It is also worried about its thousands of intelligence, military-adviser, security-forces, doctors and other personnel in Venezuela being vulnerable to “revanchismo” attacks/lynchings, and about losing revenues it receives for its personnel bolstering Maduro and his forces (paid largely or mostly by subsidized oil). President Guaido’s transitional government has already communicated to Cuba that the Cuban people per se are welcome, but that Cuban intelligence, military, and security forces personnel must leave and not prop up Maduro. The United States, the United Kingdom, the international community and President Guaido could see where there may be possible ways to address Cuba’s concerns on oil and its other interests if the delegitimized Maduro de facto regime goes away. Cuba is not going to fall on its own sword for Maduro. When I was in Cuba during 11 trips between April 2013 and late September 2015 (with the approving eyes and encouragement of US officials) regarding the Colombian peace process talks being held there at the time between the Colombian government and FARC guerrillas, one of the Cuban “minders” following the peace process and well-connected to Cuban officialdom told me that Maduro “doesn’t measure up” as a leader in the Cubans’ view, but that Cuba stuck with him basically by default because it didn’t see another option at the time that would safeguard Cuban interests. The inference by the “minder”: If Cuba’s interests were accommodated, Cuba could see Maduro as being expendable. K) Sanctions Enforcement–including most notably on Maduro’s attempts to ship oil–by the navies/coast guards of the United States, Great Britain, the Netherlands, France, Spain, Brazil or whatever willing countries. For example, Venezuelan oil shipments to Cuba could be interdicted by the Guaido government-supporting coalition of countries. That would send a strong message to Cuba for it to consider to shift its policy on Venezuela and for Cuba to consider to go along with or at least not object to a transition of government in Venezuela where there would be a timetable toward free, fair, transparent and internationally verified presidential and other elections. This could be done in bulk by the US Coast Guard, so as to not be seen supposedly as being “heavy-handed,” such as it might be viewed if it were to be done by warships. L) The United States and coalition naval/air/ground activities, in concert with the Guaido government, would be very important in enhancing the scope, distribution, and impact of humanitarian aid and protection. Of course, the senior brass and top planners of the United States’, United Kingdom’s and other coalition countries’ militaries are the best to make plans and counsel for such humanitarian contingencies with military components. 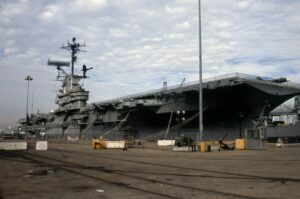 US aircraft carrier docked at a US port. This could be a well-fitting role for the United Kingdom’s new aircraft carrier the HMS Queen Elizabeth, given that a situation like this is one of its priority tasks for which it was designed and for which British tax-payers paid loads of sterling pounds. The HMS Queen Elizabeth’s doing important humanitarian duty in the Caribbean could be welcome good news in the United Kingdom where headlines of Brexit have been dominating nowadays. The HMS Queen Elizabeth aircraft carrier, in conjunction with, say, one or two US Navy amphibious assault ships like the USS Kearsarge or USS Iwo Jima (which are like mini-aircraft carriers) and/or a US aircraft carrier, and support ships–including hospital ships like the USS Comfort–could work together in international waters, along with other coalition navies, off the coast of Venezuela to carry out and safeguard humanitarian efforts. The United States, the United Kingdom, and other coalition countries, in concert with the Guaido transitional government, could have the option of making air drops or plane landings in secured areas of Venezuela to deliver humanitarian aid. M) A vote of approval from the Lima Group, the Organization of American States or another international body on potential circumstances where appropriate military force in defense of humanitarian efforts could be authorized. N) If Maduro forces try to attack humanitarian centers/zones, it would give the international humanitarian coalition supporting the Guaido transitional government legitimate self-defense reasons to respond with the military force deemed fitting, and that could mean the end of the Maduro delegitimized de facto regime in very short order. O) The United States Senate should not continue to delay a full-floor confirmation vote on a new US ambassador to Venezuela’s important neighbor Colombia, especially at this critical time. President Trump nominated in November 2017 State Department career diplomat Joseph Macmanus to be US ambassador to Colombia. Having not been confirmed by the beginning of 2019 due to scheduling, procedural or political delays (including from a “hold” placed by Republican Senator Mike Lee over questions about Macmanus’ being an executive aide to then-Secretary of State Hillary Clinton and about the 2012 Benghazi episode), Macmanus’ nomination was returned to President Trump and is currently in limbo. If the US Senate won’t act expeditiously on this, President Trump could consider his US Constitutional option of making a recess appointment for this ambassadorship. While a US-participating international coalition could overwhelm (militarily or otherwise) the delegitimized Maduro de facto regime, a big question is: What dangers could happen after the Maduro delegitimized de facto regime were to depart? There could be a possibility of the formation of Chavista/Madurista guerrilla groups, to be joined by Colombian Marxist guerrillas who have found sympathy and evident sanctuary from Maduro in Venezuela. There are already Chavista/Madurista “colectivos”—somewhat paramilitary-like militias supporting the Maduro de facto regime. This could be a threat to international humanitarian forces which enter Venezuelan territory, whether Maduro is present or gone, and a possible development to be taken into account by policy-makers and others. The needs and challenges of stabilization and rebuilding Venezuela post-Maduro would be enormous and would take years.